Elmore is a rural township on the western side of the Campaspe River, 45 km north-east of Bendigo. It is at the junction of the Northern and Midland Highways and was at the junction of the railway lines to Echuca and Cohuna until the latter was closed in stages during the 1980s and 1990s. Elmore is situated in part of the Burnewang pastoral run (1841) of which a section was sold in about 1857 and named Elmore Estate. The name was probably inspired by Elmore, Gloucestershire, England. Elmore was close to the route travelled by gold diggers from Bendigo to the Ovens/North East goldfields, and a village was formed about 5 km southwards at Runnymede. There is a record of there being an Elmore Hotel in the vicinity. 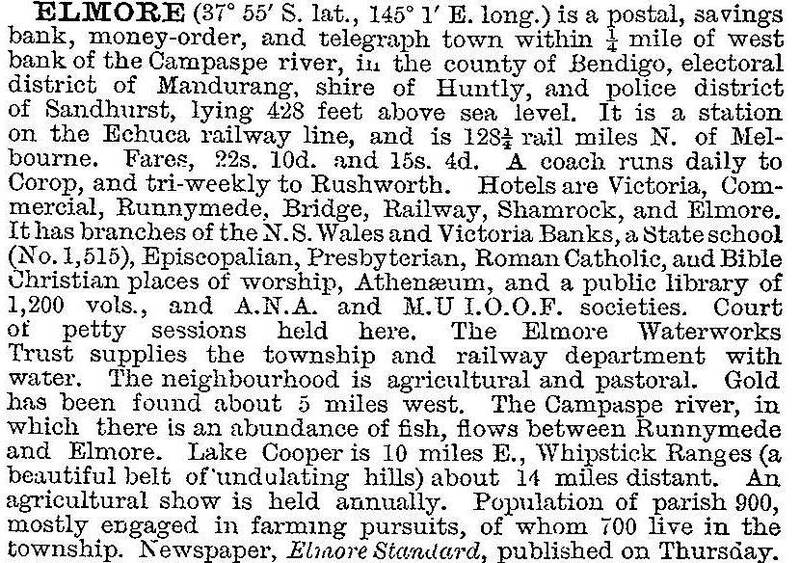 The Elmore district was surveyed in 1857 and the railway line opened between Bendigo and Echuca, via Elmore in 1864. Town lots were sold soon afterwards. An immediate effect was a decline in Runnymede on the other side of the Campaspe River, and the bridging of the river in 1870 hastened the process. A private school was opened in Elmore in 1865, and replaced by a government school in 1875. An athenaeum was opened in 1885 and it, along with the railway station and water tower (1871) are registered historic buildings. Numerous other unregistered buildings form intact heritage streetscapes. In 1915 the junction railway line was opened form Elmore to Cohuna. Elmore had a diverse farming base, including vineyards (until affected by Phylloxera in the 1920s), dairying, poultry, sheep grazing and cereals. Milk was supplied to the Rochester dairy factory, and Rochester drew ahead of Elmore as irrigation from the Waranga Reservoir western channel was extended to and west of Rochester. A saleyards was opened at Elmore, however, in 1912, running weekly sales with Rochester. The flour mill which opened in 1873 operated continuously until shortly before 1960. Elmore’s hospital began in 1924, became a bush nursing centre in 1939, and survived a threat of closure in the early 1990s before being amalgamated to form the Rochester and District Health Service in 1993.